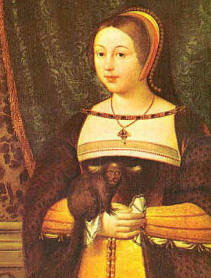 Margaret was Henry VIII's elder sister. Her husband was King James IV of Scotland. Margaret's son was James V.
Margaret's second husband was Archibald Douglas, earl of Angus. Margaret's third husband was Henry Stewart.